How can I hide the keywords that I don't want to show? For those reviews contained bad content on it, you can simply filter it by keywords blacklist. Go to General Settings, in section 2 you will see FILTER REVIEW WITH KEYWORD box. Enter the blacklist keywords such as China, Aliexpress,... or whatever you don't want to show on the comment. 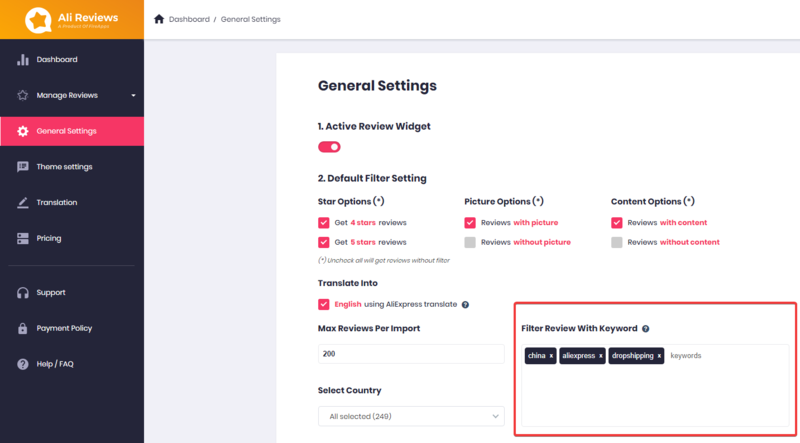 Remember to save settings, then Ali Reviews will filter and hide all the reviews with those keywords.